What Section 75 Means For You & Your Credit Card - Moneyhome.co.uk - The Best Moneysaving Blog ever! Have you ever had a purchase go wrong? Maybe you bought an item that didn’t work, or paid for a service and the provider went out of business, or flat-out didn’t provide? This can happen to anybody, at any time. The world is an unpredictable place, ever changing, and there are an infinite number of ways for things to go wrong. Enter section 75. Section 75 came into existence during the early 1970’s, when the government decided nobody should have to pay off debt for something they didn’t receive, or that didn’t work. They did this by making it a law that credit providers are equally responsible as the provider/retailer if something goes wrong with a purchase. This means if you make a purchase costing from £100 to £30,000 on credit, and the purchase goes wrong, you have the right to claim from not only the provider/retailer, but also the credit provider. Why is this better than just the retailer being responsible? Because now, if the retailer is unable to replace or reimburse, say for example they’re broke and out of business, then you still have a way to claim your cash back. As you can see, it’s pretty straight forward on the outside. Now we’ll take a look making the most of this law. 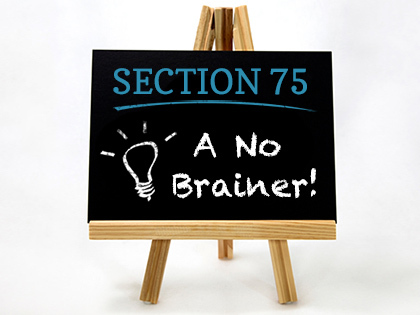 Section 75 applies to a variety of credit agreements, although is most relevant to credit cards. 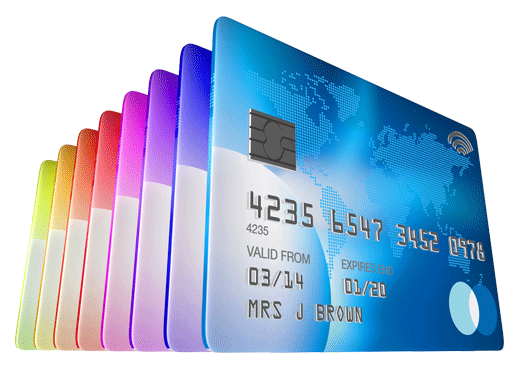 Store cards are another method of payment that is often covered. The law can, however, be a little vague on certain points. Let’s start with the cost of the item. As you can see, the cost needs to be between £100 and £30,000. The ‘cost’ though, is not the cost of your purchase as a whole. It’s the cost of a single item. Let’s use flight tickets as an example. You could buy two of them at £90 each, meaning you spent £180. However, each ticket (a single item), was under £100, so you are not protected by this law. This also applies if you buy an outbound flight for £80, and a return flight for £70. The same is true if you buy a table for £90, and four chairs at £30 each. No item breaks the £100 mark, so you are not covered. Bundled items work around this though. So if you buy a deal that offers “2 flights for £150”, you are now covered, as you purchased ‘one item’. That ‘one item’ just happened to be ‘2 tickets’. See how that works? With the table and chairs, if you buy it as a set, then it’s a single item as well. One final point about single item’s is that they only consider the cost of the item. So a £99 stereo with £5 delivery will NOT be covered. The item was still £99. As you can see, it’s the cost of the item that matters, not the cost paid on the card. That also means if you pay a deposit on something, using your card, and the item was worth £100-30,000 you are covered by section 75. For example, paying a £80 deposit on your £800 holiday means you’re covered for the full amount, even if you pay the other £720 by other means. Some items are not covered at all under section 75. Any purchase involving land will not be covered, neither would any business borrowing. The way the law is worded, it only applies if you are getting credit for the item, not to purchase the item with cash or other funds. So debit cards aren’t covered, since they use your account funds and an overdraft, not a pre-existing credit agreement. Also, the purchase must be made by the person who owns the card/agreement. If you give additional cards to family members, their purchases will not be covered unless they are buying something for you. This is why you should personally make any large purchases. Section 75 also only applies if you buy directly from the seller, not through a 3rd party. Buying something from Amazon, eBay, or any other marketplace are unlikely to be protected. It also means if you use your card to pay Paypal, who are then paying the seller for you, you lose out on section 75 protection. You can however order items from abroad. You can also make purchases while you are abroad. In both cases, the law still protects you as long as you’re a UK citizen. Before you make a claim, you should first contact the retailer. They have the first responsibility to reimburse you, and this is the simplest process. They also have a legal responsibility to reimburse you if the service/product wasn’t provided. Sometimes it isn’t possible to go to the company, like if they went out of business. There are also situations when the company may outright refuse your claim. These kind of situations are where you should contact your credit provider. By having gone to the retailer first, it also helps your case with the credit provider. The credit provider is whoever your credit agreement is with, which is different from the card provider. Card providers are companies like Visa, and MasterCard. Say you hold a TSB Visa credit card. Your credit company then is TSB, not Visa. In the case of a store card, your claim is with the credit provider, not the store. On contacting the provider, inform them that you want to make a claim under section 75 of the Consumer Credit Act, and request a form. They should send this out to you to be filled in. In the case they don’t, send them a request in writing, and keep copies. Keep in mind during this process – section 75 isn’t a company policy. It’s a law. You have a legal right to request your refund from the credit provider. Should they want to make an attempt at recovering the cost from the retailer/provider, that’s up to them, it shouldn’t affect you. Finally, if you still can’t get a resolution, ask your credit provider for a letter of deadlock. The next step is to contact the Financial Ombudsman Service, and use this letter to refer your claim to them. Once eight weeks pass from the time you first claimed with the credit provider, you don’t need the letter to begin the Ombudsman service. The Financial Ombudsman is a free service, and takes into account more factors than a regular claims court. Those factors are all to the customers advantage. 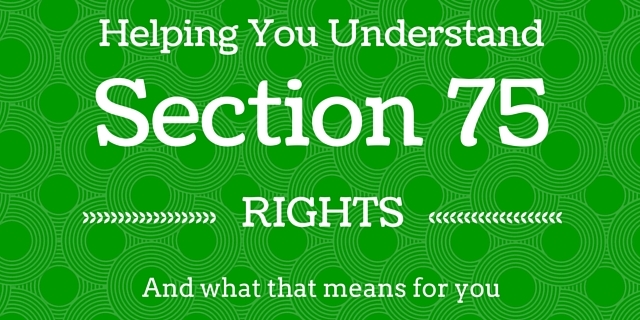 That about wraps up our look at section 75. Remember, to make sure you’re as well covered as possible, take an in-depth look at the Consumer Credit Act before making any large purchases.